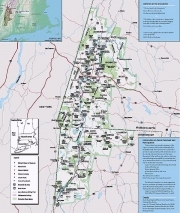 The Upper Housatonic Valley National Heritage Area includes 9 towns in Connecticut and 20 towns in Massachusetts. The Connecticut towns are Canaan, Colebrook, Cornwall, Kent, Norfolk, North Canaan, Salisbury, Sharon, and Warren. The Massachusetts towns are Alford, Becket, Dalton, Egremont, Great Barrington, Hancock, Hinsdale, Lanesboro, Lee, Lenox, Monterey, Mount Washington, New Marlboro, Pittsfield, Richmond, Sheffield, Stockbridge, Tyringham, Washington, and West Stockbridge. The upper Housatonic Valley is a singular geographical and cultural region that has made significant national contributions through its literary, artistic, musical, and architectural achievements, its iron, paper, and electrical equipment industries, and its scenic beautification and environmental conservation efforts. The only National Park Service unit in the area is the Appalachian National Scenic Trail, which runs the length of the valley. In the process of researching this heritage area feasibility study, four heritage themes interpreting the region have been identified. REVOLUTIONARY WAR AND THE DEVELOPMENT OF DEMOCRACY—there were important events related to the Revolutionary War era, Shays’ Rebellion, and early civil rights. SOCIAL GROUPS—this includes Shakers, African-Americans, American Indians, and various ethnic groups.